Three-thousand and five hundred words in one afternoon is not that bad, and it is a clear sign that I’m back in the game – nothing better than clearing one’s desk to start anew. Maybe it’s the change of season, too – the cold cold winter is over, and now the days are getting longer. Meanwhile, new projects are popping up all over the place, and as I was saying to a friend over the weekend, I’d rather need a few six-packs of 36-hours days. But apparently they don’t make them anymore. And the reading material is piling up – I have here a nice little essay about the Marxist theory of the Cthulhu Mythos that is really what the doctor ordered to find some distraction and possibly a few story ideas. And I’m waiting for my copy of the last Spillane book – because I’m not a fan but it was the man’s centenary, and the ebook was real cheap, and with a fantastic cover, and so I pre-ordered it. And finally, I’ve been asked to give a demonstration of my Tarot-reading skills, and who knows, maybe I found myself a new job. So, all in all, two days out of the Astigianistan hills were good for my health and my writing and everything else. I should take more frequent vacations. Categories: My Projects | Tags: Mickey Spillane, odds and ends, Tarot | Permalink. A very short post – just to announce that while trying (uselessly) to bring some order to a bookshelf, I found my old Tarot deck . Yes, the one I mentioned as lost/misplaced in a post a few days back. It was hiding in a metal box, originally housing a bottle of Ferrari bubbly wine, and currently full of old postcards. Clearly I stuffed a lot of odds and ends in the box while packing before I moved, and never looked inside in, ehm… five years . Now if this is not a sign from destiny, I do not know what it is. Categories: Armchair adventuring | Tags: post-move confusion, Tarot | Permalink. I can’t find my tarot deck anymore – it’s here somewhere, but ever since I moved to the country, I’ve been unable to find it. I had an interest in the subject, in cards and divination and so on, as a kid – what with dabbling in stage magic and reading the Tarot books by Piers Anthony. 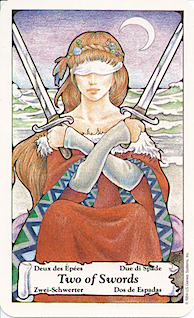 I got my tarot deck as a joke, in the mid-80s. A set of Hanson-Roberts cards – beautifully drawn. 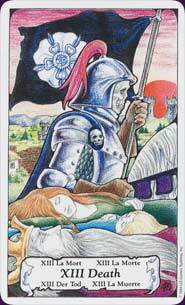 With time I learned how to read the cards, and I read some good books on the subject (Alejandro Jodorowski! ), and so on. My answer, Janine, is No. Categories: My Projects | Tags: Alejandro Jodorowsky, Cartomancy, Piers Anthony, Tarot | Permalink.